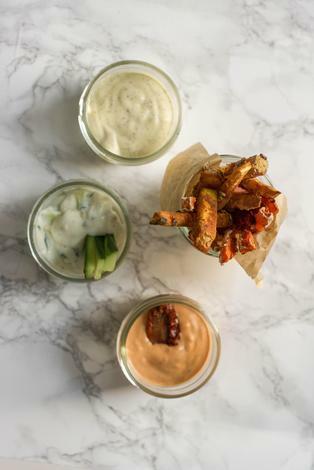 Crunchy, spicy root veg fries with three vegan dips - mustard mayo, sundried tomato mayo and coconut raita. To get aquafaba - drain a can of chickpeas (or reserve the cooking water from cooking the beans), and use the liquid in the recipe. Get all your ingredients ready and scrub all your vegetables. Have 2 baking trays read to place your fries onto. You also will need a stick blender and a tall jug, to make the vegan dips in. Preheat your oven to 220c or Gas Mark 6. First, start with the fries, slice all the veg into thin strips. Place the aquafaba in a shallow dish. In another dish, add the flour, chilli and tumeric powder, give them a mix to combine. Take a slice of vegetable, dip it in the aquafaba, and then toss in the flour mixture. Lie the veg on the baking tray. Repeat this with all the veg you have, you may need to make more chilli/flour mix or add more aquafaba. Place the fries in the oven and bake for 20-25 mins, keeping an eye on the veg as you cook it, as some ovens will vary. While the fries are cooking you can make your dips. For the vegan mayos: add all ingredients except the oil. Using the immersion blender, blend for 10 seconds. Grab the oil, continue to blend, adding a slow steady stream of oil into the mix. It should start to thicken as the oil is added. Blend to your desired consistency (I like it nice and thick). Scoop into jars - these mayos will last a few weeks in the fridge. For the vegan raita; add all ingredients into a bowl and give it a good mix. 2-3 tablespoons aquafaba - see notes above for aquafaba.